For those extra slices of your favorite pie, for always giving you the right advice, for unfailingly putting your needs first - your Mom deserves to be pampered with the finest Mother's Day Gifts. Each bouquet has been exquisitely designed with the best roses, lilies and other exotic flowers to bring you only the best. Whenever it came to pampering you, your mom never thought twice. Now it's your turn to make her feel special. We've made the choice easy for you with our Mother's Day Specials and prompt Mother's Day delivery. Only the finest Mother's Day gifts have been tastefully put-together to delight your mom. 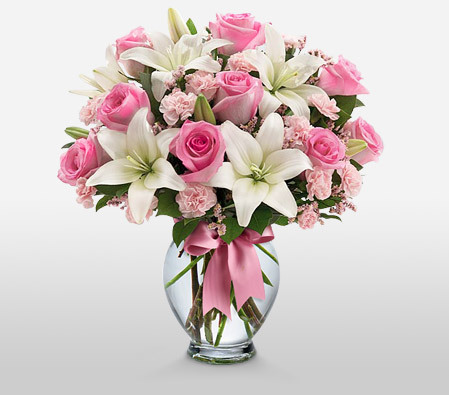 Be it flower delivery or delivery of any other gift, we handle it with extra care. With our wide array of Mother's Day flowers and gifts, we help you say it in the best possible way. Whether your mom loves flowers,soft toys or has a sweet tooth for chocolates - we have just the right Mother's Day gift to make her day. Showing love and appreciation to your mom doesn't get better. Book your Mother's Day gift now.